Garbage Pail Kids aren't just a thing in North America. The disgusting little buggers have international appeal with different releases in virtually every corner of the world. 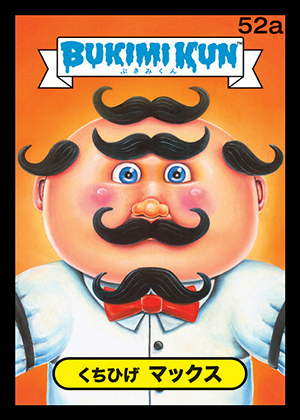 2014 Topps GPK Bukimi Kun brings back one of the rarest of the global incarnations, offering a Japanese take on 2014 Topps Garbage Pail Kids Series 1. Available initially as an exclusive on Topps.com, the cards are Japanese variations of the main set. The images are identical and the numbering is the same. There are 66 different characters, each with 'a' and 'b' versions. Parallels include Black (1:2 packs) and Gold (1:24 packs). Each box promises a trio of inserts. The big one is either an Artist Autograph or a Printing Plate parallel. Boxes also have a Bonus Sticker. Bukimi Kun debuted with the original Series 1 release back in 1985 and included a sticker album. They're exceptionally rare today with singles often trading online for $250-300 each. 2014 Topps GPK Bukimi Kun boxes come with 24 packs, each with eight cards. 132 cards (a and b versions for 66 different cards). 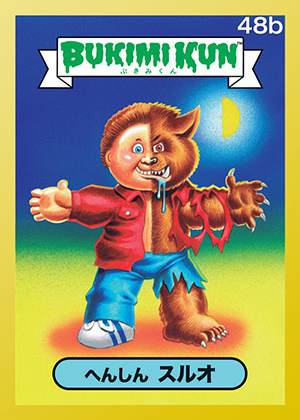 For English translations, see the 2014 Topps Garbage Pail Kids Series 1 checklist. Shop for base sets on eBay. 4 cards. Inserted 1:24 packs. Good: Interesting nod to an obscure part of GPK history, makes for creative experience for those who can’t read Japanese. Bad: Lack of original image content. 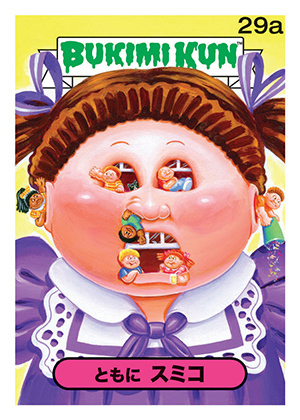 The Bottom Line: Garbage Pail Kids has a long history of international exclusives. They help make up the lore of the line. 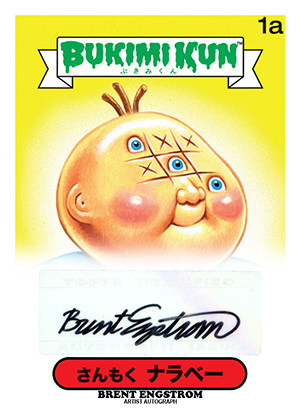 2014 Topps GPK Bukimi Kun may not have the same impact, but the online distribution adds to the exclusivity. The overall lack of inserts makes for a straightforward experience, but one that’s got an added bit of mystery for those like me who can’t read Japanese. It’s simple, it’s fun and you should get a full set to go along with a few extras. The characters in Bukimi Kun match up with those in 2014 Topps Garbage Pail Kids Series 1 so there aren’t any surprises. Besides the Bukimi Kun ribbon along the top and Japanese names, the number has been enlarged like the original Bukimi Kun set. Also replicating the original Japanese set from 1985 are the generic backs. Rather than comics and other varied styles used for the American set, all Bukimi Kun back read the same thing. I’m just not sure what it is. The few inserts the set has are all parallels so there’s not a lot of variety. But that’s okay as something that largely repeats a previous release should be simple. What I found interesting was the experience of going through the cards. Not knowing what the translations are (nor have I memorized the 2014 GPK Series 1 checklist), it made for something strange and a little absurd. I was forced to use my imagination. Oddly, it made the gross things a bit more gross and even horrific. And because it’s Garbage Pail Kids, that’s a good thing. 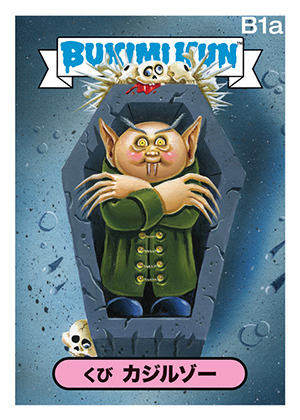 Most of the people who are going to collect Bukimi Kun likely already have the 2014 Topps Garbage Pail Kids Series 1 set. So with a repeating checklist, there isn’t a lot that’s new other than the look and label. And for something like this, it’s a good thing. Picking up a box is a nice little novelty. It shouldn’t be a daunting experience. There are parallels and autographs for those who want a chase element, but it’s likely most will be looking to the base set and the ability to wrap it up easily. And that’s exactly what Bukimi Kun offers. Getting a full base set is key to Bukimi Kun. 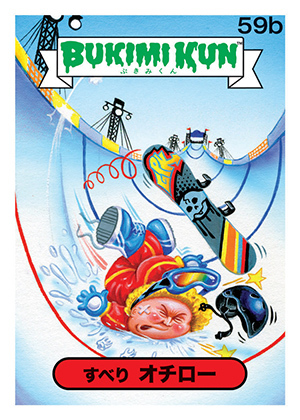 The last GPK Mini online exclusives had such a big checklist it took many boxes to finish. I don’t find that level of challenge fun when it amounts to a parallel set. I was able to get a complete set here with a handful of leftovers. The Black and Gold parallels are nice for trade bait or an added challenge. The Autographs and Printing Plates aren’t the most exciting hits, but those have fans too. Given the reasonable price and, what should be a limited print run, this is a very solid box for collectors. 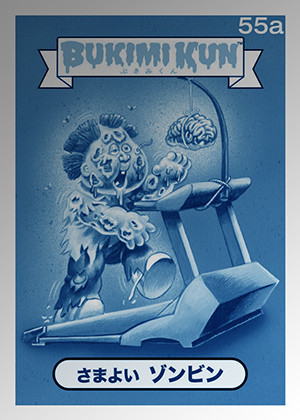 2014 Topps GPK Bukimi Kun doesn’t set out to change the hobby. It’s a simple nod to a small corner of an already niche market. It’s also not very pricey and easy to collect, something that’s rare in the hobby today.